Drafting MLB rookies and prospects each season can be one of the most fun aspects of a draft and also one of the trickiest. Just rewind to 2018 draft season for a good example of this. Scott Kingery and Ryan McMahon were two trendy sleeper rookie picks last spring that most everyone wanted to get their hands on. By June, neither were worth owning due to poor play and/or lack of playing time. Then, on the other hand, you have a guy like Juan Soto that NOBODY was drafting in 2018 leagues due to the fact that he had never had an at-bat above low Single-A. He was a phenomenal prospect, but obviously, no one expected him to reach the Majors in 2018, let along in the middle of May. Those are just two extreme examples of how things can go very wrong or turn into a gem of a waiver wire add. Handling MLB rookies in the fantasy baseball world is always trickly, but hopefully this article will help you navigate through them all. Note: This is not a top prospect list. Players are ranked below by expected 2019 value and has nothing to do with long-term dynasty value. Also, if I believed that someone had a 10% chance or less of debuting this year, they will not be included below. Of course Vladimir Guerrero Jr is #1. Who else would it be? I don’t really need to go too in depth on why Guerrero is going to be the top rookie this season. Everyone with a pulse should know why. His combination of power, contact, and feel for hitting makes him an immediate threat to hit .300 with 30-plus home runs. And while this Toronto lineup isn’t the juggernaut it used to be, there’s still enough around Vladdy for him to approach or exceed 150-plus R+RBI if he can get 450-500 at-bats this season. Once service time is out of the way, Guerrero will magically have fixed whatever “issues” he was working on at Triple-A Buffalo and will become an immediate top-10 fantasy third baseman. Draft with confidence in rounds 3-5. The return of Bryce Harper would put a damper on this ranking a little, but I’m still in the mindset that Harper likely leaves town. 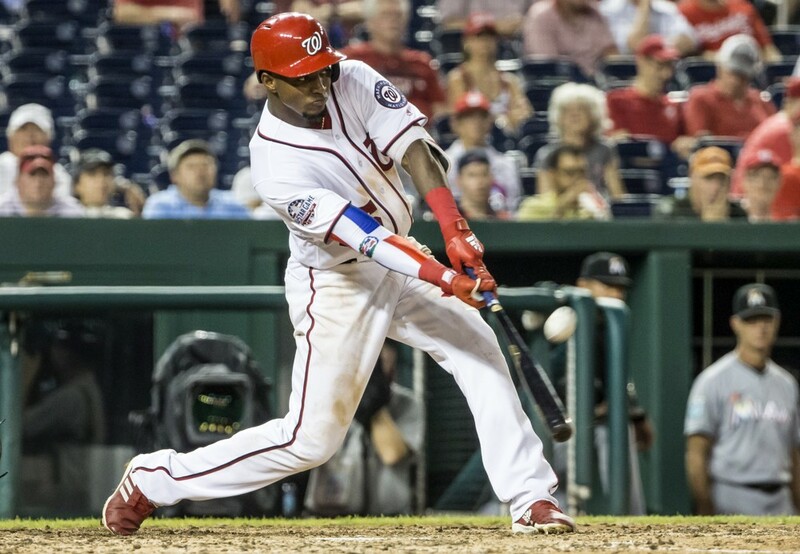 Even if Harper returns, Robles is likely to get some serious run in the Nationals outfield this season. The immediate and long-term upside with Robles are both quite high. He has the contact skills to hit north of .300 and is a plus runner capable of 40-plus steals over a full season. There’s also 20-homer pop in his bat due to his exceptional bat speed, clean swing, and natural loft. Now, I’m obviously not projecting all of those numbers during his rookie season, but as long as he gets mostly every day playing time, something in the vicinity of .280/15/30 is a distinct possibility. Robles is currently going off the board just after pick 100 and could easily return top-50 value this season. Another post-service-time window call-up, Jimenez carries almost as much 2019 upside as Vladdy and can be drafted several rounds later. Since getting to full-season A-Ball in 2016, Jimenez has hit .327 with per-600 AB averages of 46 doubles and 28 homers. And for a slugger of his magnitude, Jimenez doesn’t strike out often. His career strikeout rate sits at 18.2% and was just 15.1% last season. With plus contact skills and easy plus-plus raw power, we could be looking at another Aaron Judge/Giancarlo Stanton type player once he gets his feet wet in the Majors. Don’t expect that level of production right away, but once he’s called up, Jimenez should hit for both average and power, making him a damn good selection around his current ADP. There’s also zero road blocks in the White Sox current outfield. Once he’s up, Jimenez will be a lineup mainstay. Once all the service time rubbish passes, I mean he “works on his defense more”, Alonso will be up with the Mets and starting regularly at first base the rest of the way. No current Mets first base option is going to stand in his way either. Sorry Dominic Smith fans. This spot belongs to Mr. Alonso for the foreseeable future. Once the minor league home run champ is up, get ready to see balls flying out of Citi Field with regularity. This is one of the best power bats in the minors and will soon be one of the best power bats in the Majors. And with an improving Mets lineup around him, 150-plus R+RBI this season are within reach to go along with 25-30 or more homers and an average that won’t kill you, likely in the .270 range. Why do you hate rookies? Please do us all a favor and play the kids, or at least, play Garrett Hampson full-time. The playing time situation has gotten a little bleaker for Hampson after the Daniel Murphy signing. However, with Murphy penciled in to play first base, that leaves a Spring Training battle between Ryan McMahon and Hampson for the starting second base job. With the offensive potential of each player, the lineup around them, and the Coors Field factor, whoever wins the job will have considerable fantasy upside this season. If I had to put $100 of my own money on this battle, my money is on Hampson. A 2016 3rd round pick, Hampson does two things incredibly well; Hit for average and steal bases. Two of the things we love the most in the fantasy world. In each of his three minor league seasons, Hampson has hit at least .301 with 36 or more steals. His per-600 at-bats numbers you ask? How about a .315 average, 10 homers, 75 RBI, 116 runs, and 60 steals. Obviously, he’s not going to turn into Ricky Henderson this season, but assuming he does win the second base gig, Hampson carries considerable fantasy upside in batting average and steals at the very least. He’s one of my favorite targets in the middle rounds of mixed league drafts and a top-100 NL-Only option. Our first pitcher on the list, Kikuchi signed with the Mariners at the end of December and carries immediate fantasy upside. In his eight seasons in the Japan Pacific League, Kikuchi posted a 2.81 ERA, 1.18 WHIP, 3.3 BB/9, and 8.0 K/9. Those numbers have been even better over the last two seasons with a 2.48 ERA, 0.97 WHIP, 2.4 BB/9, and 9.5 K/9. Kikuchi mixes a low-90’s fastball, wipe out slider, a slow curve, and a very seldom used changeup. The upside here isn’t quite on Ohtani levels, but if you look at what Hiroki Kuroda did early in his career with the Dodgers, I believe that’s a fair expectation for Kikuchi this season. He’s currently being drafted outside the top-50 pitchers and could wide up as a top-40 SP at season’s end. A rookie catcher in the top-10? You better believe it. In a world where the catcher landscape is full of headaches and question marks (just check out our catcher rankings/projections), grabbing an up and coming rookie catcher like Jansen could be one of the best moves you make this season. Jansen isn’t a flashy catcher that will hit .300 like Joe Mauer or slug 30-plus dingers like Gary Sanchez, but he offers a solid AVG/HR baseline with an added boost in OBP leagues thanks to his strong plate approach. Seeing Jansen end in the .270/.350/.425 range with around 12-15 homers wouldn’t shock me in the slightest. That would make him a borderline top-10 catcher with the potential to finish in or near the top-5. Say what you want about his power and speed, but Luis Urias can hit. He’s also currently penciled in as the starting shortstop in San Diego, so he’s got that going for him too. For his minor league career, Urias slashed a cool .306/.397/.405/.802 and had more walks than strikeouts until his stint in the PCL last season. The power and speed upside might not be overly high here, but over a full season, Urias could finish in the vicinity of 15 and 10 respectively while providing a solid batting average. He’s a fine late-round selection in mixed leagues and a borderline starting option in NL-Only formats. If I could guarantee an opening day roster spot, Luzardo would be a few spots higher and the #1 pitching option on this list. And while I wouldn’t 100% rule that out, it’s most likely that Luzardo starts back at Triple-A to start the season. The Peruvian southpaw absolutely dominated the California and Texas Leagues before getting roughed up a bit in his four PCL starts. Though he’s barely 21, Luzardo shows advanced poise on the mound and has rock-solid control over his dynamic three pitch arsenal, with all three pitches being considered plus or better. Assuming he gets back to his dominant ways to start the season in the PCL, Luzardo should be up before too long and has the upside to be a top-40 SP once he’s up with low ratios and around 9-9.5 K/9. This one will be a tough situation to handle as it will likely take until late in Spring Training until the back end of the Braves rotation is decided. Unfortunately, not all of the Braves young arms that debuted last season will crack the 2019 OD rotation. In fact, if things stay as they are now and no injuries/trades happen, there’s likely only going to be one spot open as Mike Foltynewicz, Sean Newcomb, Julio Teheran, and Kevin Gausman are all under contract for the 2019 season. Like Luzardo, Touki dominated in the minors last season to the tune of a 2.38 ERA, 1.13 WHIP, and 10.8 K/9 between Double-A and Triple-A. That strong performance earned him a call-up to Atlanta for five starts and two relief appearances later in the season where he struck out more than a batter per inning. 11. Justus Sheffield, SP, Seattle Mariners – Coming over from the Yankees in the James Paxton deal, Sheffield now has a much clearer path to playing time. He likely will crack the opening day rotation and has the upside to finish as a top-50 SP with decent ratios and near a strikeout per inning. 12. Josh James, SP, Houston Astros – You can honestly rank 9-12 any way you want to. It’s 100% about personal preference. James looks like he’ll start the season in the rotation, and with his stuff, he immediately becomes a solid mid to late-round mixed league target with the upside for 10+ K/9. Just don’t be surprised if the Astros limit his innings this season. 13. Kyle Tucker, OF, Houston Astros – He’d be a borderline top-5 rookie option if I could guarantee he sees 500-plus at-bats this season. But that’s far from a certainty following the Michael Brantley signing. The power/speed upside and 20/20 potential gives him plenty value once he works his way into the lineup on a daily basis. 14. Nick Senzel, 2B/3B, Cincinnati Reds – Some how, some way Senzel is going to hit his way into the Cincinnati lineup. When that will be is still uncertain though due to the depth in the Cincinnati infield already. But once Senzel is up, his plus-plus contact skills will give him immediate value with some pop and speed mixed in. If you want to give a flier on him in your NL-Only league, go right ahead. Those in mixed leagues (unless super deep), should wait to pounce when he’s looking close to being promoted. 15. Alex Reyes, SP, St. Louis Cardinals – Yes, he’s still considered a rookie. His ultimate role and how many innings he’ll pitch this year is still up in the air, but regardless, the upside Reyes possesses makes him worth drafting in all formats. He should enter the rotation at some point and has top-30 SP upside this season. Just expect him to be monitored closely due to his injury troubles over the last few seasons. 16. Francisco Mejia, C, San Diego Padres – Another player I’d rank higher if I could guarantee consistent playing time. With Austin Hedges around, Mejia likely is only going to get 2-3 starts a week behind the plate at most while getting a little time elsewhere around the diamond. I just don’t see him getting enough at-bats in 2019 to have a Major impact. For now, he’s better suited for NL-Only leagues or deeper mixed leagues. 17. Forrest Whitley, SP, Houston Astros – The top pitching prospect in the minor leagues and an overall top-10 prospect, Whitley has the highest upside of any pitcher on this list. If he can get off to a good start in Triple-A, a mid-season promotion is likely in the cards. His dynamic four-pitch arsenal and high strikeout upside will make him a hot commodity once he’s up. 18. Keston Hiura, 2B, Milwaukee Brewers – Once Keston Hiura is up, he’s a potential top-100 overall player. The hit tool is that good and his raw power is starting to show up more consistently in games. If he can get 250-300 at-bats this season, Hiura could hit close to .300 and go 10/10. 19. Brent Honeywell, SP, Tampa Bay Rays – Hey look, another promising Rays pitching prospect. Must be something in the orange juice down there. Honeywell is working his way back from Tommy John surgery but should be ready to go by mid-season. With a deep and dynamic arsenal and above-average command, Honeywell has the potential to be a top-50 SP for the second half of the season. 20. Nathaniel Lowe, 1B, Tampa Bay Rays – The 2018 season was Lowe’s coming out party. The hulking first baseman finished with a .330/.416/.568/.985 slash line with 32 doubles, 27 homers, 102 RBI, and 83 runs scored across three levels, finishing with Triple-A Durham. There’s not much of a road black in Lowe’s path to playing time, so once the Rays deem him ready, Lowe should play close to every day at either first base or DH. He’s definitely worth a late-round pick in AL-Only formats due to his ability to hit for both average and power and makes for an intriguing stash in mixed leagues. 21. Ty Buttrey, RP, Los Angeles Angels – In the running for the Angels closer role during Spring Training. Closers matter too right? Buttrey performed fairly well in the role late last season and could be a serviceable RP3 if he lands the gig. 22. Austin Riley, 3B, Atlanta Braves – With the addition of Josh Donaldson, Riley will now have plenty of time to work on cutting down his strikeouts at Triple-A Gwinnett. Get ready to pounce though as Donaldson hasn’t exactly been a beacon of health lately. Riley has the chance to hit for both power and a respectable average once called up. 23. Brandon Lowe, 2B/OF, Tampa Bay Rays – The Rays lineup is currently full, so Lowe is likely to open the season in a utility role or back at Triple-A Durham. There’s some intrigue here once he gets called up due to his ability to provide some power and speed with a respectable batting average and play multiple defensive positions. Versatility always has some value to it. 24. Mike Soroka, SP, Atlanta Braves – If Soroka wins a job out of Spring Training, go ahead and flip him and Toussaint in these rankings. If not, Soroka is likely waiting for poor play from an Atlanta starter (Cough, Gausman) or an injury to open up a rotation spot. Once up, he very well could be a top-50 SP ROS. 25. Alex Verdugo, OF, Los Angeles Dodgers – Just when you think Alex Verdugo is going to get a chance, the Dodgers sign A.J Pollock. There’s still some hope though as Joc Pederson trade rumors are beginning to swirl. If Verdugo can get regular at-bats, whether it’s with the Dodgers or after being traded to another organization, a .280/15/15 type of season is well within reach. Bonus: Brendan Rodgers, 2B/SS, Colorado Rockies – Rodgers has the offensive prowess to be a top-5 option on this list. However, the Rockies notoriously hate rookies/prospects and have an infield logjam as it is with Hampson and McMahon duking it out for the 2nd base job and Story/Arenado entrenched on the left side of the infield. Another Rookie Starting: Richie Martin, SS, Baltimore Orioles – Assuming the Orioles don’t bring another shortstop, Martin is penciled in as the starter this season. After a breakout campaign where he hit .300 with 25 steals in Double-A, Baltimore took him #1 overall in December’s rule-5 draft and plan to give him plenty of time at shortstop this season. There’s some decent AL-Only upside here, but I wouldn’t look at him yet in mixed leagues, at least, not to start the season. I might have forgotten someone. Yell at me if I did.